2. Move more: Walking, running, cycling, golfing, Zumba, basketball, hiking – we don’t care what it is – just move! Participating in regular physical activity is a great way to keep your weight down, but that’s not all. The joints in your body are designed to move and operate under a “use it or lose it” principle. The more active we are (i.e. the more we move) the healthier our joints. It’s when you stop moving that pain and weakness start to settle in which is inevitably followed by pain. Find some sort of physical activity you enjoy and stick with it! 3. Learn proper lifting: You’ve heard your whole life – “Lift with your legs!” Oh how true it is! Did you know bending forward at your back increases disc pressure by half! Add a load to that and try to lift it and pressure on your spine discs increases more than 100%!! 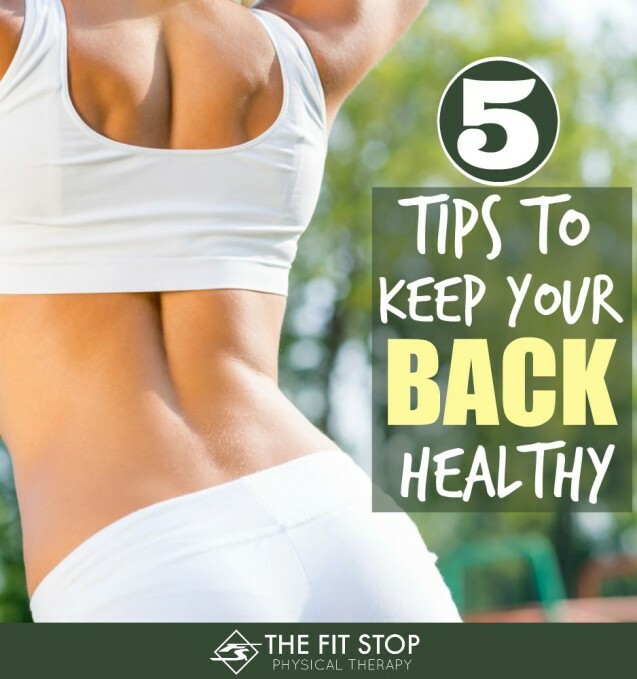 One thing you can do to ensure your back stay pain-free is to learn how to lift correctly – keep your back straight, bend at your knees, and lift with your legs. For more information on correct lifting mechanics check out this post on the Fit Stop Blog. 4. Avoid desk-job-itis: We humans were simply not designed to sit. In fact pressure in your lumbar discs is 40% higher in sitting than it is in standing. If you have a desk job or find yourself sitting for long periods of time, one of the best things that you can do for your back health is to GET UP AND MOVE! I tell my patients you should stand and stretch/walk around for at least 5 minutes every hour, but most people would benefit from even more than that (5 minutes every 30 minutes). 5. If you have to sit – do it correctly: If you do sit at work, proper positioning is vital to maintaining a healthy spine. You should sit with your back supported and both feet flat on the ground. Your knees and hips should both be at 90 degree bends and your head directly over your shoulders (not leaning foward). A lumbar roll will help support your lower back in a proper position to decrease stresses, also. Back pain can be a debilitating, miserable injury. Like most things in life, a little preventative maintenance goes a long way in avoiding big problems down the road. Our spine specialists at Fit Stop are here to answer any questions you may have – if you feel that you might benefit from consulting with us please don’t hesitate to contact one of our four clinics by clicking on the links below. I like your very first tip, and I think it’s really important. People need to understand the importance of a healthy body weight, and to understand how the health of one aspect can affect the health of other parts of your life. It’s better if you can be healthy in all aspects of your life. Well said, Dolores! Thanks for the comment! !